The realization that your business isn’t quite working out the way you’d planned isn’t a fun one. 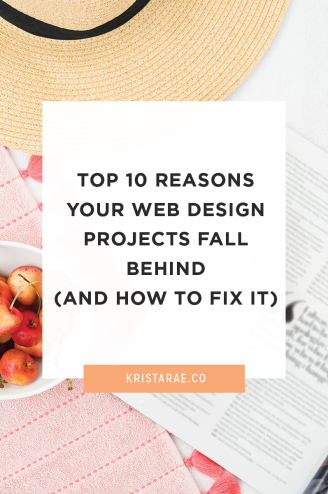 You might look back at your last few projects and see that the clients weren’t the type you want to be working with. Or you might not have any past clients to look back on and feel like you’ll never create a consistent income. I’ve been there. We’ve all been there. It’s a scary feeling, but know that there’s always a way to improve and start turning your business into what you want it to be. Over and over again I see the same mistakes with designers related to their services and the way they’re getting the word out. These mistakes are attracting the wrong people and keeping you from making the money you deserve. 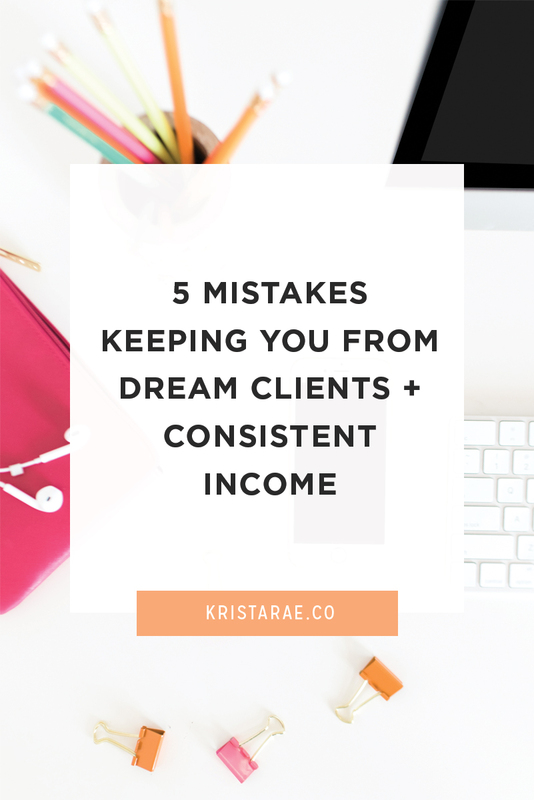 So today we’re going to go over 5 mistakes that are keeping you from dream design clients and consistent income. This is one you might not expect and honestly something I never would have embraced without fighting through it myself and that is having a lack of balance. This includes balance in work, in life, and between the two. When I think back to my last few big ideas, none of them came while sitting in front of the computer. My most profitable idea ever came on my drive home after running errands. I’m very confident I wouldn’t have had that idea if I would have had my husband run those errands for me so I could keep working (which I’ve done far too many times). To have the ability to take a step back and have “ah-ha” moments about improvements that can be made or changes you’d like to see you, need to give yourself space to do so. And space comes as a result of balance. If you need to learn how to prosper in your business, be sure to check out Britney’s Implementation Week presentation! Without packages, you’re asking prospective clients to tell you what they need when in reality, they just aren’t in a place to do that. They’re looking for an expert who can see their situation and tell them what they need. If you have too many packages or packages that aren’t aimed at a specific client, prospects are going to be overwhelmed by choices and underwhelmed by the results they see themselves getting. To learn more about design packages that sell, tune into Katie’s Implementation Week presentation! If you price your packages low enough or the same as your competition, clients will be more likely to book you, right? First, wrong. Second, that is not how to build a business that supports you. In reality, you first need to find out how much money you need to make to survive and thrive. From there you can price your services effectively and know exactly how many projects you need to book in a given time period. To price for profits and raise your rates, tune into Erin’s Implementation Week presentation! You can have powerful service packages that are priced perfectly, but if you don’t know how to position those packages on a sales page you won’t get very far. Your sales page should get clients excited, tell them exactly what they’re going to get (with a big focus on results), and get them to take that next step. The biggest mistake I see is having a bulleted list of features (font system, moodboard, logo, etc.) and that’s it. 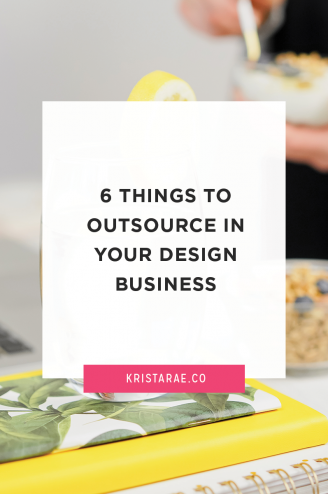 Instead, paint your clients a picture of the transformation they’ll see, make it clear who your services are for, and sprinkle in some good testimonials to get them excited. To learn how to create a sales page that attracts your dream clients, check out Melissa’s Implementation Week presentation! I used to sit around and hope that a new client would come through the door when I needed them to. Sometimes they did…and sometimes they didn’t. In reality, having a waiting list is the only way you can guarantee that next project will happen when you need it to. It sounds intimidating, but building a waiting list doesn’t have to be difficult and filled with gross marketing tactics. There are ways that every business can create simple and effective routines to continuously build interest around their services. In fact, I do it in about 20 minutes per week! 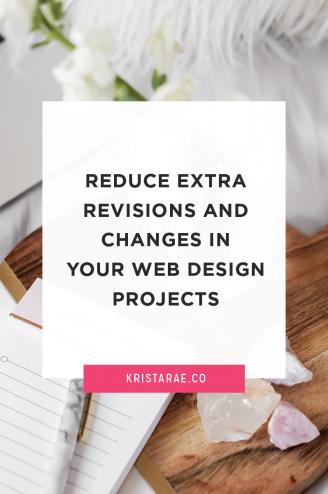 Learn one routine you need to raise prices and build a happy waiting list in Kyla’s Implementation Week presentation! Look back at the 5 mistakes we went over, choose the one that is currently effecting you the most, and take action on it. 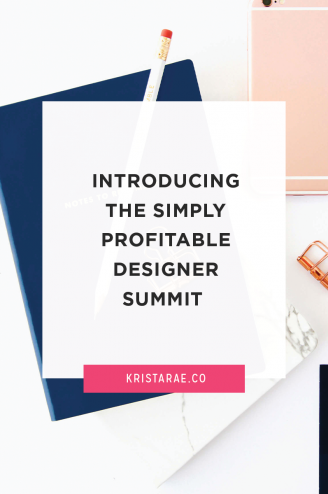 For group accountability, personalized support, powerful presentations, premium bonuses, and a whole lot more, be sure to grab your ticket for Implementation Week where we’ll be focusing on Your Simply Profitable Design Services!